Successful leaders know that leadership is less often about having all the answers--and more often about asking the right questions. The challenge lies in being able to step back, reflect, and ask the key questions that are critical to your performance and your organization's effectiveness. In What to Ask the Person in the Mirror, HBS professor and business leader Robert Kaplan presents a process for asking the big questions that will enable you to diagnose problems, change course if necessary, and advance your career. He lays out areas of inquiry, including questions such as: *Do I clearly articulate my vision and top priorities to my employees and key constituencies? *Does the way I spend my time enable me to achieve my top priorities? *Do I give subordinates timely and direct feedback they can act on? Do I actively seek feedback myself? *Have I developed a succession roadmap? *Is my organization's design aligned with the achievement of its objectives? *Is my leadership style still effective, and does it reflect who I truly am? Packed with real-life situations, this highly readable and practical guide helps you learn to ask the right questions--and work through the answers in ways that are right for you. By asking these questions, you can tackle the inevitable challenges of leadership as you craft new strategies for staying on top of your game. &#147;Rob Kaplan is an outstanding leader and business executive. 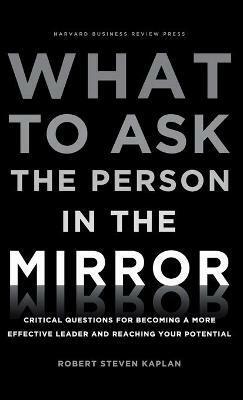 In What to Ask the Person in the Mirror , he provides a valuable and adaptable framework that can be used by business and nonprofit leaders. This book lays out the important questions that leaders should ask in order to achieve their goals and reach their potential." &#151; Henry M. Paulson, Jr.
Robert Steven Kaplan is president and chief executive of the Federal Reserve Bank of Dallas. Previously, he was the Senior Associate Dean for External Relations and Martin Marshall Professor of Management Practice in Business Administration at Harvard Business School. He is the author of three books: What You Really Need to Lead, What You're Really Meant to Do and What to Ask the Person in the Mirror.